An 1890 book advocating British Israelism. According to the doctrine, the Lost Ten tribes of Israel found their way to Western Europe and Britain, becoming the ancestors of the British and related peoples. British Israelism (also called Anglo-Israelism) is a pseudoarchaeological movement which holds the view that the people of the British Isles are "genetically, racially, and linguistically the direct descendants" of the Ten Lost Tribes of ancient Israel. With roots in the 16th century, British Israelism was inspired by several 19th-century English writings such as John Wilson's 1840 Our Israelitish Origin. The movement never had a head organisation or a centralized structure. Various British Israelite organisations were set up throughout the British Empire as well as in America from the 1870s; a number of these organisations are active as of the early 21st century. In America, its ideas gave rise to the Christian Identity movement. The central tenets of British Israelism have been refuted by evidence from modern archaeological, ethnological, genetic, and linguistic research. According to Brackney (2012) and Fine (2015), the French Hugenot magistrate M. le Loyer's The Ten Lost Tribes, published in 1590, provided the first expression that "Anglo-Saxon, Celtic, Scandinavian, Germanic, and associated cultures" were direct descendants of the ancient Israelites. Anglo-Israelism has also been attributed to Francis Drake and James VI and I, who believed he was the King of Israel. Adriaan van Schrieck (1560-1621), who influenced Henry Spelman (1562-1641) and John Sadler (1615-1674), wrote in the early 17th century about his ideas on the origins of the Celtic and Saxon peoples. In 1649, Sadler published The Rights of the Kingdom, "which argues for an 'Israelite genealogy for the British people'". 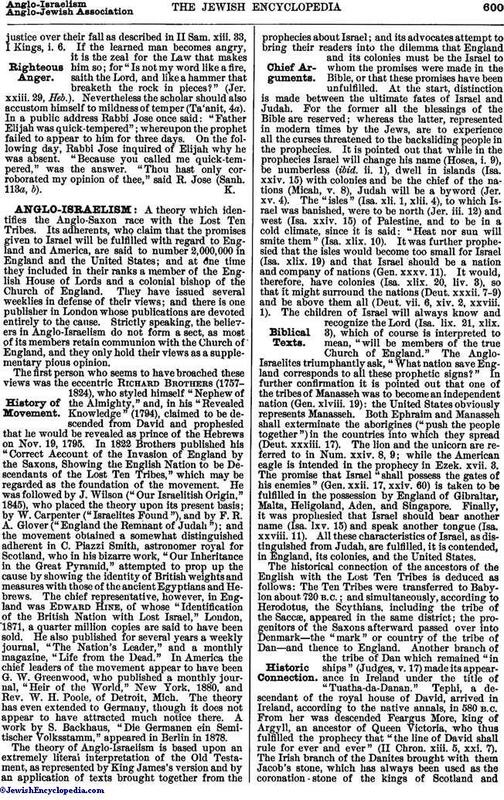 Aspects of British Israelism and its influences have also been traced to Richard Brothers' A Revealed Knowledge of the Prophecies and Times in 1794, John Wilson's Our Israelitish Origin (1840s), and John Pym Yeatman's The Shemetic Origin of the Nations of Western Europe (1879). Although scattered British Israel societies are known to have existed as early as 1872, there was at first no real move to develop an organization beyond the small groups of believers which had arisen spontaneously. The beginnings of the movement as an identifiable religious force can, therefore, be more accurately placed in the 1880's when the circumstances of the time were particularly propitious for the appearance of a movement so imperialistically-orientated. Between 1899 and 1902, adherents of British Israelism dug up parts of the Hill of Tara in the belief that the Ark of the Covenant was buried there, doing much damage to one of Ireland's most ancient royal and archaeological sites. At the same time, British Israelism became associated with various pseudo-archaeological pyramidology theories, such as the notion that the Pyramid of Khufu contained a prophetic numerology of the British peoples. In 1914, the thirty-fourth year of its publication, the Anglo-Israel Almanac listed details of a large number of Kingdom Identity Groups operating independently throughout the British Isles and in Australia, New Zealand, South Africa, Canada, and the United States of America. During its peak in the early 20th century, British Israelism was also supported by John Fisher, 1st Baron Fisher. A prolific author on British Israelism during the later 1930s and 40s was Alexander James Ferris. The BIWF continues to exist, with its main headquarters located in Bishop Auckland in County Durham. It also has chapters in Australia, Canada, The Netherlands, New Zealand and South Africa. In 1968, one source estimated that there were between 3,000 and 5,000 British Israelites in Britain. There, the theology of British Israelism has been taught by a few small Pentecostal churches. The espousal of British Israelism by George Jeffreys, founder of the Elim Pentecostal Church, led to a schism, precipitating his 1939 resignation and the formation of the Bible-Pattern Church Fellowship, which continues to teach the doctrine. The teaching of British Israelism was vigorously promoted beginning in the 1960s by Herbert W. Armstrong,:57 founder and former Pastor General of the Worldwide Church of God. Armstrong believed that the teaching was a key to understanding biblical prophecy: "One might ask, were not biblical prophecies closed and sealed? Indeed they were—until now! And even now they can be understood only by those who possess the master key to unlock them." Armstrong believed that he was called by God to proclaim the prophecies to the Lost Tribes of Israel before the "end-times". [unreliable source?] Armstrong's belief caused his separation from the Church of God Seventh Day because of its refusal to adopt the teaching. Armstrong created his own church, first called the "Radio Church of God" and later renamed the "Worldwide Church of God". He described British Israelism as a "central plank" of his theology. After Armstrong's death, his former church abandoned its belief in British Israelism and changed its name to Grace Communion International (GCI) in 2009. It offers an explanation for the doctrine's origin and its abandonment by the church at its official website. Church members who disagreed with such doctrinal changes left the Worldwide Church of God/GCI to form offshoot churches. Many of these organizations still teach British Israelism, including the Philadelphia Church of God, the Living Church of God, and the United Church of God. Armstrong promoted other genealogical history theories, such as teaching the belief that modern-day Germany represents ancient Assyria, writing "The Assyrians settled in central Europe, and the Germans, undoubtedly, are, in part, the descendants of the ancient Assyrians.". Jehu kneeling at the feet of Shalmaneser III on the Black Obelisk. Herodotus reported that the ancient Persians called all the Scythians Sacae, but that they called themselves Scoloti. However, a modern comparison among the forms given in other ancient languages suggests Skuda was their name. Ancient writers, such as Josephus and Jerome would associate the Scythians with the peoples of Gog and Magog, but British Israelist etymologists would see in Sacae a name derived from the biblical "Isaac",:294–295 claiming that the appearance of the Scythians where they claimed the Lost Tribes were last documented also supported a connection. Further, British Israelists find support in the superficial resemblance between King Jehu's pointed headdress and that of the captive Saka king seen to the far right on the Behistun Rock. The chain of etymological identification leading from Isaac to the Sacae was continued to the Saxons (interpreted as Sac's sons - the sons of Isaac),:294–295:21:121 who are portrayed as invading England from Denmark, the 'land of the Tribe of Dan'. They saw the same tribal name, left by the wanderers, in the Dardanelles, the Danube, Macedonia, Dunkirk, Dunglow in Ireland, Dundee in Scotland, and London, and ascribed to this lost tribe the mythical Irish Tuatha Dé Danann. According to the Anglo-Israelists, these claimed connections would make the British the literal descendants of the Lost Tribes, and thus inheritors of the promises made to the Israelites in the Old Testament. Some adherents further claim that the British Royal Family is directly descended from the line of King David. Citing the Book of Jeremiah, they claim that the daughters of Zedekiah fled to Egypt, then 'the isles' in the sea, which they interpret as Ireland. The descendants of these princesses are said to have crossed to England where they became ancestors of the monarchs. The Stone of Scone, used in coronations of Scottish, English and British monarchs for centuries, is claimed to be none other than the pillow stone used by biblical patriarch, Jacob. A commonly found British-Israel doctrine is that the Tribe of Ephraim and the Tribe of Manasseh can be identified as modern day Britain and the United States of America. British-Israel adherents cite numerous theological, semiotics, archaeological, and ethnological resources as proofs. Part of the foundation of the British-Israel doctrine is the theological claim that particular blessings were bestowed upon three of the tribes of Israel,:317 in that the tribe of Judah was to be the 'chief ruler' e.g. King David, and that Ephraim was to receive the birthright (See Jacob and Esau). Adherents believe that these blessings have continued down through the ages to modern times, with the British Monarchy identified as the continued blessing upon Judah, and both Britain (Ephraim) and the USA (Manasseh) as recipients of the national birthright blessing. They cite passages such as 1 Chron 5:1-2 and Gen 48:19-20 as supporting this. Another source describes the emergence of Christian Identity from British Israelism as a paradoxical "remarkable transition" from their philo-semitic origins to antisemitism and racism. :13 Their adoption of the British Israelist belief that the Israelite-derived Anglo-Saxons had been favored by God over the 'impure' modern Jews meant that a reluctantly anti-Semitic Klansman "could now maintain his anti-Semitism and at the same time revere a Bible cleansed of its Jewish taint." One such case is the distinction that British Israelists make between the “Jews” of the Southern Kingdom and the “Israelites” of the Northern Kingdom. They believe that the Bible consistently distinguishes the two groups. Dimont says that many of these scriptures are misinterpreted because the distinction between “Jews” and “Israelites” was lost over time after the captivities. British Israelists believe that the Northern Tribes of Israel lost their identity after the captivity in Assyria and that this is reflected in the Bible. Dimont disagrees with this assertion and argues that only higher ranking Israelites were deported from Israel and many Israelites remained. :5 He cites examples after the Assyrian captivity, such as Josiah, King of Judah, who received money from the tribes of “Manasseh, and Ephraim and all the remnant of Israel” (2 Chronicles 34:9), and Hezekiah, who sent invitations not only to Judah, but also to northern Israel for the attendance of a Passover in Jerusalem. (2 Chronicles 30);:6 British Israelites interpret 2 Chronicles 34:9 as referring to "Scythians". The Scythian origin of the Scots has been referred to as mythical. Algernon Herbert, writing in 1848, characterized the linguistic derivation of Scots from Scoloti as "strictly impossible", and Merrill (2005) referred to it as false etymology. Addressing their view on the fate of the exiled tribes, Frank Boys would refer to their volumous output, "All the effort to write these volumes might well have been saved on the premise that 'they were never lost,' which we believe to be the correct one." John Cox Gawler (1830–1882) was a Keeper of the Jewel House and a British Israelite author. 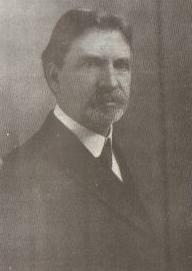 Alexander James Ferris, a prolific author on British Israelism. And did those feet in ancient time, the poem written by William Blake which is popularly known as "Jerusalem"
^ a b c d e Brackney, William H. (2012-05-03). Historical Dictionary of Radical Christianity. Scarecrow Press. pp. 61–62. ISBN 9780810873650. Retrieved 9 April 2017. ^ Eller, Jack David (2007). Introducing Anthropology of Religion: Culture to the Ultimate. p. 291. ISBN 978-1138024915. ^ Melton, J. Gordon (2005). Encyclopedia of Protestantism. New York: Facts on File, Inc. p. 107. ISBN 978-0-8160-5456-5. ^ Shapiro, Faydra L. (2015). Christian Zionism: Navigating the Jewish-Christian Border. Eugene, OR: Cascade Books. p. 151. ^ a b c Fine, Jonathan (2015). Political Violence in Judaism, Christianity, and Islam: From Holy War to Modern Terror. Rowman & Littlefield. ISBN 9781442247567. Retrieved 9 April 2017. ^ a b c d e f g Parfitt, Tudor (2003). The lost tribes of Israel : the history of a myth (1st pbk. ed., 2nd impression. ed.). London: Phoenix. ISBN 978-1842126653. ^ Wilson, J. (March 1968). "British Israelism". The Sociological Review. 16 (1): 41–57. doi:10.1111/j.1467-954X.1968.tb01291.x. ^ a b Strong, Patience (1986). Someone had to say it. Bachman & Turner, London. ISBN 978-0859741323. ^ a b c d e f Kidd, Colin (2006). The forging of races : race and scripture in the Protestant Atlantic world, 1600-2000 (1. publ. ed.). Cambridge [etc. ]: Cambridge university press. ISBN 978-0521797290. ^ a b c d Jacobs, Joseph (1901). "Anglo-Israelism". In Singer, Isidore (ed.). Jewish Encyclopedia: Anglo-Israelism. New York: Funk and Wagnalls. p. 600. ISBN 978-1117918952. ^ Indy media, IE . ^ Moshenska, G. (2008). 'The Bible in Stone': Pyramids, Lost Tribes and Alternative Archaeologies". Public Archaeology. 7(1): 5–16. ^ "Contact Us". The British-Israel-World Federation. The British-Israel-World Federation. Retrieved 24 August 2015. ^ "Other British-Israel Organisations". The British-Israel-World Federation. The British-Israel-World Federation. Retrieved 24 August 2015. ^ Wilson, J. (1 January 1968). "British Israelism: A Revitalization Movement in Contemporary Culture" (PDF). Archives de Sociologie des Religions. 13 (26): 73–80. ^ a b Anderson, Allan Heaton (2014). An Introduction to Pentecostalism: Global Charismatic Christianity (2nd ed.). Cambridge: Cambridge University Press. pp. 101–102. ^ Wilson, B. R. (1973). "American Religion: Its Impact on Britain". In den Hollander, A. N. J. (ed.). Contagious Conflict: The Impact of American Dissent on European Life. Leiden: E. J. Brill. p. 244. ^ Armstrong, Herbert (1967). The United States and Britain in Prophecy. p. 5. ^ a b c Orr, R (1999), How Anglo-Israelism Entered Seventh-day Churches of God: A history of the doctrine from John Wilson to Joseph W. Tkach, retrieved July 19, 2007 . ^ Joseph Tkach, "Transformed by Truth: The Worldwide Church of God Rejects the Teachings of Founder Herbert W Armstrong and Embraces Historic Christianity. This is the Inside Story"
^ Armstrong, Herbert (1985). Mystery of the Ages. p. 183. ^ Encyclopedia Britannica (11th ed.). p. vol. 15, p. 373. ^ a b c d e f g Allen, J.H. (1917). Judah's Sceptre and Joseph's Birthright (16 ed.). Haverhill, MA: Destiny Publishers. ^ Harmsworth's History Volume 3. pp. 1781–1782, 1784–1785. ^ "The DNA of Western European Nations". British Israel Basics. Canadian British-Israel Association. ^ Filmer, W. E. (1964). A Synopsis of the Migrations of Israel. Covenant Books. p. 5. ISBN 978-0852050613. ^ Josephus, Flavius. Antiquities. p. 11:133. ^ "British-Israel Answers its Critics". The British-Israel Church of God. ^ Poole, William Henry (1879). Anglo-Israel; Or, The British Nation the Lost Tribes of Israel. Bengough Bros. p. 23. ISBN 978-1330950692. ^ Chryssides, George D. (2012). Historical Dictionary of New Religious Movements. Lanham: The Scarecros Press, Inc. p. 65. ISBN 9780810861947. ^ a b c d e f g h Quarles, Chester L (2004). Christian Identity: The Aryan American Bloodline Religion. McFarland & co. ISBN 978-0-78641892-3. ^ Strassler, Robert (2009). The Landmark Herodotus: The Histories. New York: Anchor Books. p. 759. ^ van Donzel, Emiri; Schmidt, Andrea (2009). Gog and Magog in Early Eastern Christian and Islamic Sources: Sallam's Quest for Alexander's Wall. Leiden: Brill. pp. 10–13. ^ Capt, E. Raymond (1985), Missing Links Discovered in Assyrian Tablets, Artisan, ISBN 978-0-934666-15-2 . ^ a b c Ingram, William L. (1995). "God and Race: British-Israelism and Christian Identity". In Miller, Thomas (ed.). America's Alternative Religions. Albany, NY: SUNY Press. pp. 119–126. ^ Kelly, Aidan A. (1990). The Evangelical Christian Anti-Cult Movement: Christian Counter-Cult Literature. New York: Garland Publishing. p. 86. ^ a b c Spittler, Russell P. (1963). Cults and isms: twenty alternatives to evangelical Christianity. Grand Rapids, MI: Baker Book House Company. p. 101. ^ Friedman, O. Michael (1993). Origins of the British Israelites: The Lost Tribes. San Francisco: Mellen Research University Press. p. 62. ^ a b Merrill, A. H. (2005). History and Geography in Late Antiquity. Cambridge: Cambridge University Press. pp. 284–5. ^ Broun, Dauvit (1999). The Irish Identity of the Kingdom of the Scots in the Twelfth and Thirteenth Centuries. Woodbridge, England: Boydell Press. pp. 78–79, 119–122. 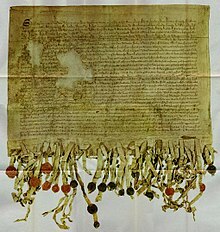 ^ "Declaration of Arbroath - English Translation". Constitution Society. ^ For example, Davidy, Yair (1996). "Lost Israelite Identity": The Hebraic Ancestry of Celtic Races. Brit-Am. pp. 240–242. , Ogwyn, John H. The United States and Britain in Prophecy. pp. 27–28. ^ a b c Pierard, Richard V. (1996). "The Contribution of British-Israelism to anti-Semitism within conservative Protestantism". In Locke, Hubert G.; Littell, Marcia Sachs (eds.). Holocaust and church struggle: religion, power and the politics of resistance. University Press of America. pp. 44–68. ^ Gershevych, Ilya (1985). The Cambridge History of Iran, volume 2: The Median and Achaemenian Periods. Cambridge: Cambridge University Press. p. 94. ^ Katz, David S. (2001). "Israel in America: The Wanderings of Lost Ten Tribes from Mikveigh Yisrael to Timothy McVeigh". In Bernardini, Paolo; Fiering, Norman (eds.). The Jews and the Expansion of Europe to the West, 1450 to 1800. New York: Berghahn Books. p. 112. ^ Hexham, Irving (2001). "British Israelism". In Elwell, Walter A. (ed.). Evangelical Dictionary of Theology (2 ed.). Grand Rapids, MI: Baker Book House Company. p. 187. ^ Ferris, A. J. (1941). Great Britain & The U.S.A. Revealed as Israel The New Order. ^ Glover, Frederick Robert Augustus (1881). England, the Remnant of Judah and the Israel of Ephraim. Rivingtons. ^ a b Armstrong, Herbert W. (2007). The United States and Britain in Prophecy. Philadelphia Church of God. ASIN B002ILY91A. ^ Wild, Joseph (1888). The Future of Israel and Judah: Being the Discourses on the Lost Tribes from How and when the World Will End. Nabu Press. p. 108. ISBN 9781287712565. ^ The Standard of Israel and journal of the Anglo-Israel association. 1875. p. 8. ^ a b Gardell, Mattias (2003). Gods of the Blood: The Pagan Revival and White Separatism. Durham, NC: Duke University Press. p. 372. ^ Life From The Dead, 1875, Vol. III, p. 154. ^ a b Barkun, Michael (2003). Religion and the Racist Right: The Origins of the Christian Identity Movement. UNC Press Books. ISBN 9781469611112. ^ "Christian Identity". Anti-Defamation League. ^ Phillips, Michael (2006). White Metropolis: Race, Ethnicity, and Religion in Dallas, 1841-2001. Austin: University of Texas Press. p. 95. ^ The Encyclopedia Britannica. 11th edn. 1910. Vol.II, page 31. ^ Hale, Amy (2016). "Reigning with Swords of Meteoric Iron: Archangel Michael and the British New Jerusalem". In Parker, Joanne (ed.). The Harp and the Constitution: Myths of Celtic and Gothic Origin. Brill Academic Pub. ISBN 9789004306370. ^ Warf, Barney (2006). "Language, Geography of". Encyclopedia of Human Geography. Thousand Oaks CA: SAGE Publications. pp. 270–275. ^ a b c d e f Dimont, Charles T. (1933). The legend of British-Israel. London: Society For Promoting Christian Knowledge. ^ "The United States and Britain in Bible Prophecy". UCG. Archived from the original on 2008-12-05. Retrieved 2009-01-14. ^ a b Todd, James Henthorn (1848). "Editor's Preface". The Irish Version of the Historia Britonum of Nennius. Dublin: Irish Archæological Society. p. xcvii. ^ Klieforth, Alexander Leslie; Munro, Robert John (2004). The Scottish invention of America, Democracy and Human Rights: A History of Liberty and Freedom from the Ancient Celts to the New Millennium. Dallas: University Press of America, Inc. p. 5. ISBN 978-0761827917. ^ Aikau, Hokulani K. (2012). A Chosen People, a Promised Land: Mormonism and Race in Hawai'i. Minneapolis: University of Minnesota Press. p. 38. ISBN 978-0-8166-7462-6. ^ Pearse, Meic (2007). The Gods of War: Is Religion the Primary cause of Violent Conflict?. InterVarsity Press. pp. 104–105. ISBN 978-0830834907. ^ McDonald, Henry (26 May 2010). "Northern Ireland minister calls on Ulster Museum to promote creationism". The Guardian. Baron, David (1915), The History of the Ten "Lost" Tribes: Anglo-Israelism Examined . Darms, Anton (1945). The Delusion of British Israelism: A comprehensive Treatise. Loiseaux Brothers, Bible Truth Depot. ASIN B01NBNXA8N. Jowett, George F (1980) . The Drama of the Lost Disciples. London: Covenant Publishing Company Ltd. ASIN B003VP662W. . A work of theoretical history which covers many relevant themes of Biblical and British connections. Kellogg, Howard, British-Israel Identity, Los Angeles: American Prophetic League . Kossy, Donna (2001) , "The Anglo-Israelites", Kooks: A Guide to the Outer Limits of Human Belief (2nd exp. ed. ), Los Angeles: Feral House, ISBN 978-0-922915-67-5 . May, HG (16 September 1943), "The Ten Lost Tribes", Biblical Archaeologist, 16: 55–60 . McQuaid, Elwood (Dec./Jan. 1977–78), "Who Is a Jew? British-Israelism versus the Bible", Israel My Glory: 35 . Michell, John (1999). "Jews, Britons and the Lost Tribes of Israel". Eccentric lives and peculiar notions : with 56 illustrations (Paperback/electronic ed.). Kempton, Ill.: Adventures Unlimited Press. ISBN 978-0932813671. Reisenauer, Eric Michael (September 2008). "Anti-Jewish Philosemitism: British and Hebrew Affinity and Nineteenth Century British Antisemitism". British Scholar. 1 (1): 79–104. doi:10.3366/brs.2008.0006. Wilson, John (1 January 1968). "The Relation between Ideology and Organization in a Small Religious Group: The British Israelites". Review of Religious Research. 10 (1): 51–60. doi:10.2307/3510673. JSTOR 3510673. Robinson, BA, Anglo-Israelism and British Israelism, Religious Tolerance . This page was last edited on 6 March 2019, at 02:40 (UTC).